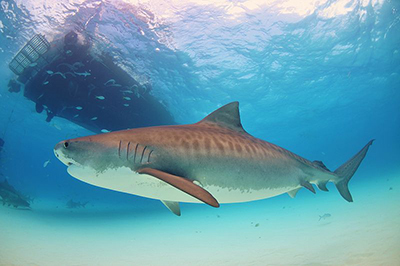 The tiger shark (Galeocerdo cuvier) is a species of requiem shark and the only extant member of the genus Galeocerdo. It is a large macropredator, capable of attaining a length over 5 m (16 ft 5 in). Populations are found in many tropical and temperate waters, especially around central Pacific islands. 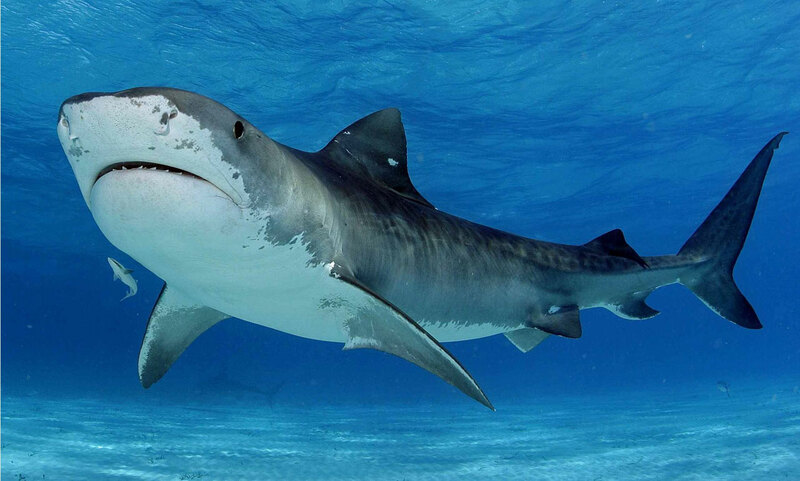 Its name derives from the dark stripes down its body, which resembles a tiger’s pattern but fade as the shark matures. 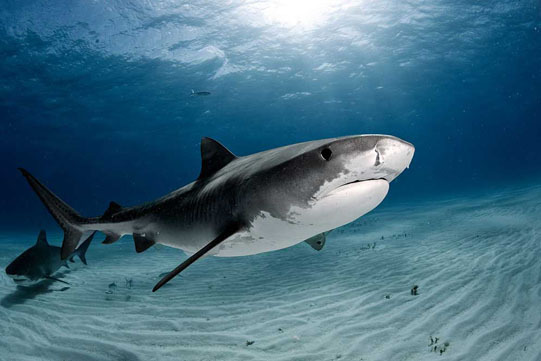 The tiger shark is a solitary, mostly nocturnal hunter. 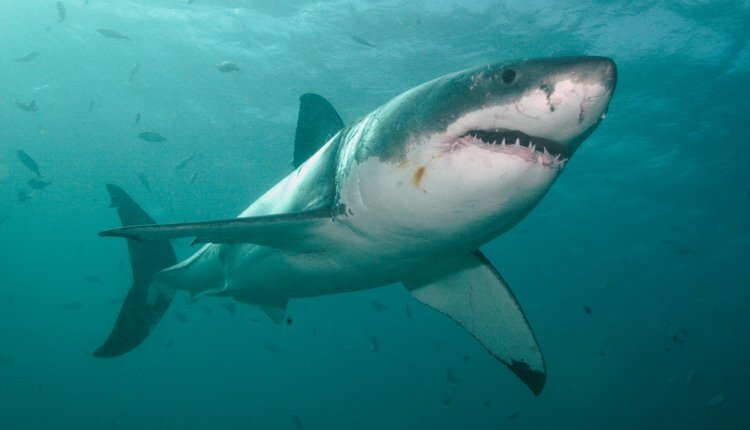 It is notable for having the widest food spectrum of all sharks, with a range of prey that includes crustaceans, fish, seals, birds, squid, turtles, sea snakes, dolphins, and even other smaller sharks. 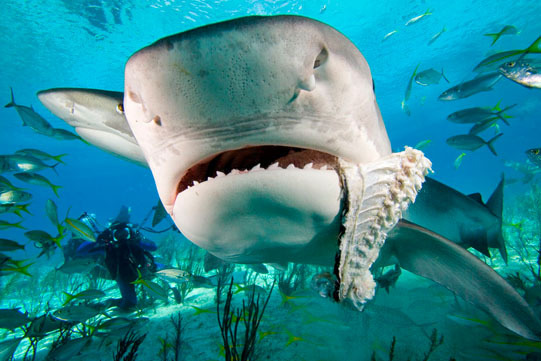 It also has a reputation as a “garbage eater”, consuming a variety of inedible, man-made objects that linger in its stomach. 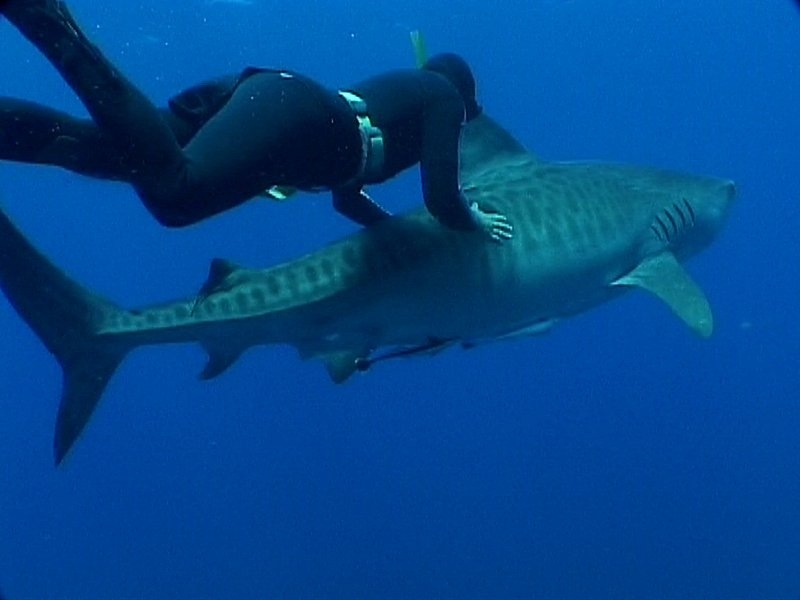 Though apex predators, tiger sharks are sometimes taken by groups of killer whales. 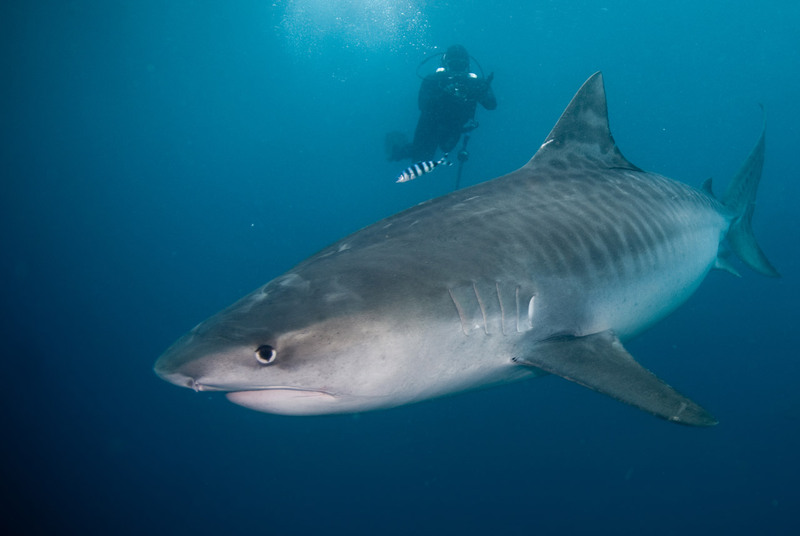 It is considered a near threatened species due to finning and fishing by humans. It favours warmer waters and is rare in the Cape. Occasionally found far out at sea, but more often in turbid, coastal waters. It may enter estuaries. Males mature around 250 cm (8 years) and females around 274 cm (11 years). Breeding appears to take place well north of KwaZulu-Natal. Aplacental viviparous development. The litter averages 35 pups which are born at 60-70 cm. This species may exceed 700 cm. It is a most indiscriminate feeder and is best described as a scavenger. An all-embracing diet features marine mammals, turtles, seabirds and a variety of bony and cartilaginous fish and cephalopods. An assortment of such garbage as carrion, tin cups and plastics are also ingested. 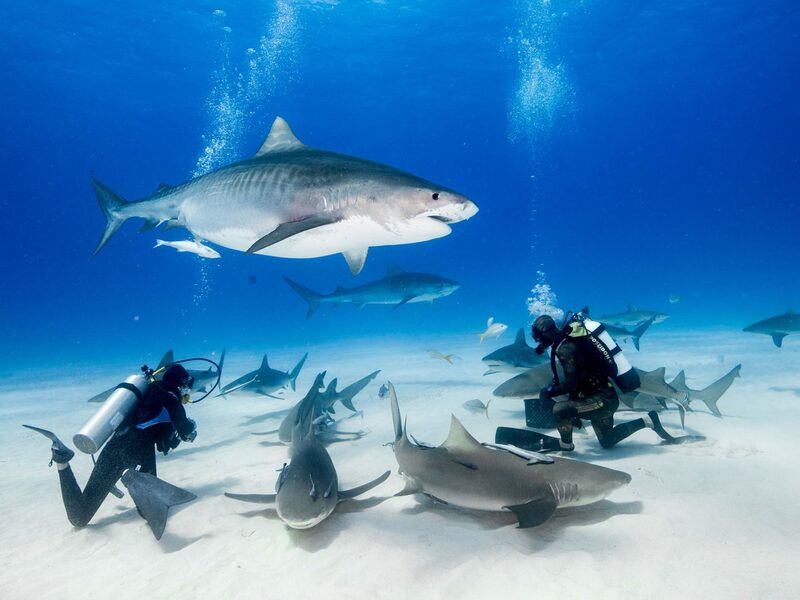 Tiger sharks belong to one of the most popular shark families: the requiem sharks. 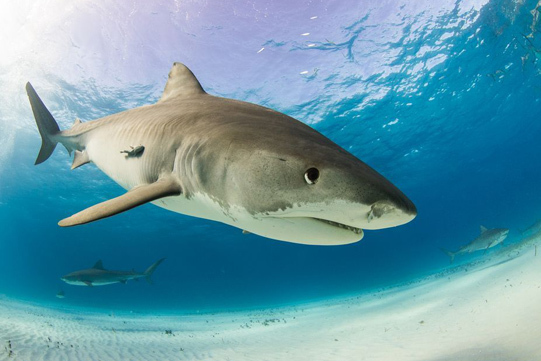 Many of the best-known sharks—the ones we see the most and the ones that are most abundant in the ocean—are requiem sharks. 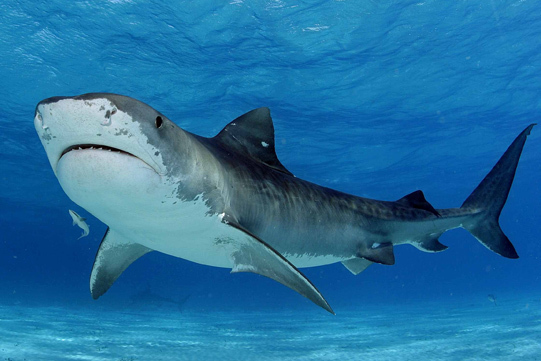 Some requiem sharks are aggressive hunters, including tiger, bull, and oceanic whitetip sharks. Some, particularly the oceanic whitetips, are loners. Some are social and spend time with each other, sometimes teaming up to catch prey or to ward off attackers. 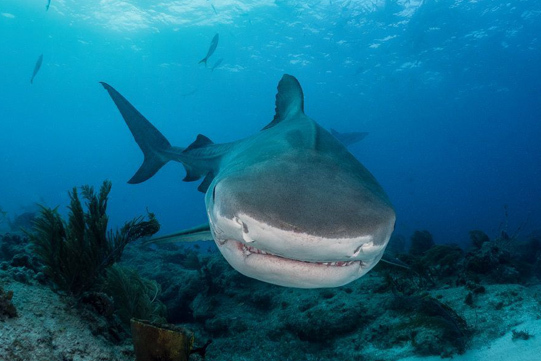 And some requiem sharks, particularly lemon sharks, seem to like hanging out together. 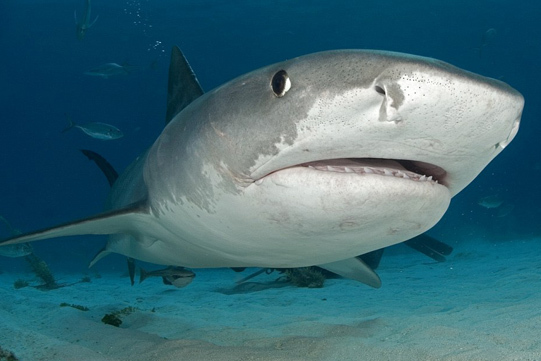 Their personalities may be diverse, but all 54 species of requiem shark –including the tiger shark – share a few physical traits in common: they’re all good swimmers with strong bodies, small eyes, nictitating membranes (third eyelids), and long fins behind their gills. 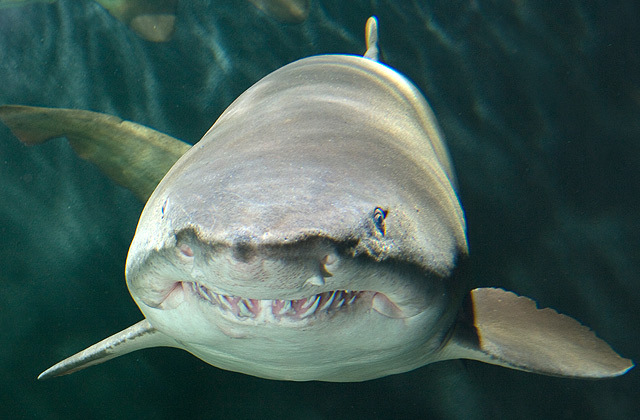 2003: 17 sharks sighted and 100% success rate per day. Activity at the ground station was poor and thus the surface and subsurface work did us proud. It broke through to new levels of viewing and behavioural understanding. Please bring suntan lotion and a hat.